An addictive, character-driven psychological mystery... a quick, one-sitting read that will keep you glued to the pages. Phantom Limb is a character-driven mystery that begs to be read in a single setting. 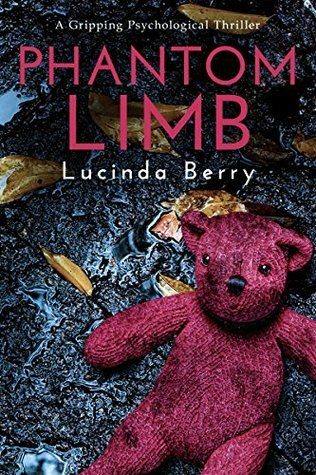 Phantom Limb by Lucinda Berry was a dark and twisted thriller. Berry's background in childhood psychiatry and trauma really shines through in this book and it was so interesting to read this story with that kind of insight and expertise backing it up. Twins, Elizabeth and Emily, have been through a life of trauma together. A childhood where their mother locked them in a room with a bucket, starved them, and brought 'special friends' to see the girls. Their freedom all thanks to an accidental fire the girls set, which then led to a media storm, and then being adopted by a loving family. Now in their twenties, Emily is in a deep depression and Elizabeth is starting college and a new relationship. Elizabeth comes home to discover Emily dead and then next thing she knows she wakes up unable to move and with a fuzzy memory in a psych ward. She needs to uncover the secrets and find out what really happened to Emily. The effects of trauma are different on everyone. This book is the best example of that. Emily can barely function on a day to day basis, while Elizabeth was moving on with her life. This, of course, does not mean that she had moved past or fully accepted what had happened to her. Anything with psych wards or diving into how the human mind words in different situations is so intriguing to me. We spend most of our time within the psych ward and sitting in on the therapy sessions. The book kept me guessing and I definitely was not expecting that ending! If you want a good psychological thriller, then this is the next book for you! Identical twins, Emily and Elizabeth, grew up with adoptive family after suffering serious abuse as children. Now, as adults, Elizabeth finds herself constantly caring for her twin. Emily participates in self-harm and Elizabeth finds Emily on the floor of their bathroom, dead. Waking up strapped down, unable to move or speak, Elizabeth finds herself in a hospital where everyone is saying Emily died two years prior. As Elizabeth delves deeper into her past to uncover what happened to Emily, she is also forced to remember all the things from her past that she has worked so hard to forget…. Phantom Limb is my second novel I have read by Lucinda Berry and, let me tell you, these novels keep getting better and better. 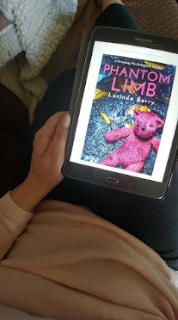 Phantom Limb, a character driven thriller, was completely addicting. I couldn’t put this novel down. Fast paced, dark, and filled with twists, it isn’t easy to lose track of time within the pages. I do not want to say too much about the plot because, truly, this one has so many moving pieces all working together to create some serious twists and turns. The human mind is incredibly complex and Berry wastes no time within her prose proving this point. Nothing is as it seems. As a clinical psychologist, Berry knows what she is talking about related to trauma and the human mind. This one is dark with detailed descriptions of self-harm and abuse; at several points in the novel, I found myself having to take a small break and read something lighter. 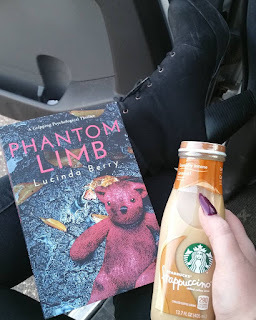 However, I couldn’t stop thinking about Phantom Limb and would end up going back to read more! If you want a short psychological thriller that packs a serious punch, Phantom Limb would be an obvious choice for you! Identical twins, Emily and Elizabeth endure the wrath of their abusive mother who disappears, leaving them locked in a room with no food or water for days at a time. After an accidental fire that essentially saves their lives, they are taken in by a family determined to love them. Unfortunately, no amount of love and care can make them forget their childhood horrors and they continue to depend solely on each other to get through their day to day existence. Then Elizabeth finds Emily in the bathroom, dead... the next thing she remembers is waking up in the hospital and her path to recovery in the psych ward brings up shocking revelations. As a person who has always been fascinated with the human mind, I used to read about disorders all the time, for my own interests and for my degree in Social Work. It's amazing what the brain can do and how people can see things about themselves that no one else can. The book spends most of its time within the psych ward and I was entranced with the various disorders presented and the therapy provided. It really reminded me of some of the classes I took in college and delving into the DSM-IV in pure fascination and wanting to learn as much as possible. I had a few thoughts of where the book was going but was surprised by the ending and solidified my already high rating. Over all I felt this was a very well put together psychological thriller that really took me back on a personal level. I look forward to more work from this author.